All indicators are only a method to repackage complex information in a simple and repeatable way. I have said before that divergence indicators (like my own Multidivergence Indicator) are not good trade signals by themselves. What they are good for is context. You will still need some entry criteria of your own to decide when to enter a trade. You should also have a stop and a target identified before entry, which are basically a plan for if you are wrong and a plan for if you are right. Here’s a trade I did not take, but I saw developing in real time. It becomes a useful case study for a divergence setup in $TSLA that had a positive outcome. There was a divergence between the high prices and the RSI indicator for a week or two beforehand. By itself, that doesn’t tell you to sell. Price kept pushing higher even in the face of the divergence. The divergence eventually resolved and went away, and the uptrend continued. But it was telling you that in this context, the trend might be getting tired. You could be looking for a reason to sell. If you try to front-run it, you can get destroyed. Bull markets are built on the smoldering bodies of early bears. Almost everyone saw that big ugly candle in $TSLA the other day, selling off after threatening to move into all time highs. 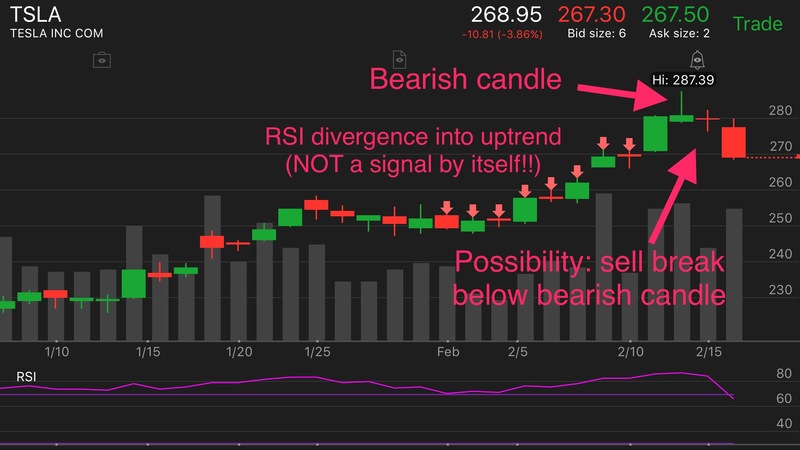 Using the context of the earlier RSI bearish divergence, this candle was another good piece of information. You have several signs pointing to reversal now. One trade plan could have been to sell a break of the low of that candle, with a stop above the candle high just in case you are wrong. Whatever you do, STICK TO THE ORIGINAL STOP LOSS. Stops only move toward profit, never toward more losses. If you were wrong and price had spiked to new highs in the trend you’d eat the 8 points or so and move to the next trade. In case you were right, maybe you set a target to cover around $255 support, or maybe you sell half and let the rest ride until you see a bullish reversal candle. There’s a lot of great options when you are right! That’s the easy part. If you had taken the trade, you had a big follow-through day today on the downside, and you’d be sitting on about 10 points of profit. One more good day and your target could be hit. Remember, indicators only give you information. You as the trader have to decide what to do with it, taking into account your psychology, risk tolerance, account size, and all the other fundamentals. This entry was posted on February 16, 2017 at 6:09 pm and is filed under Thinkscript, Trading System Development. You can follow any responses to this entry through the RSS 2.0 feed. You can leave a response, or trackback from your own site. Were you using the updated version of the divergence? Just wondering if you were, was there increased divergence at the potential reversal? For the first three I’d say it was increasing a little, but from 4 on it was decreasing. I’m still fidgeting the way I decide if divergence is increasing or decreasing though.